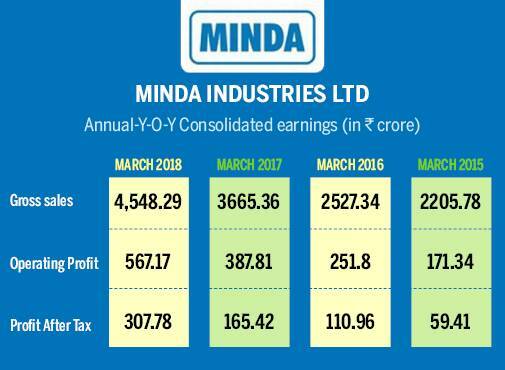 Minda Corporation has reported results for third quarter ended December 31, 2018. The company has reported a rise of 51.75% in its net profit at Rs 24.78 crore for the quarter under review as compared to Rs 16.33 crore for the same quarter in the previous year. Total income of the company increased by 14.98% at Rs 288.72 crore for Q3FY19 as compared Rs 251.10 crore for the corresponding quarter previous year. 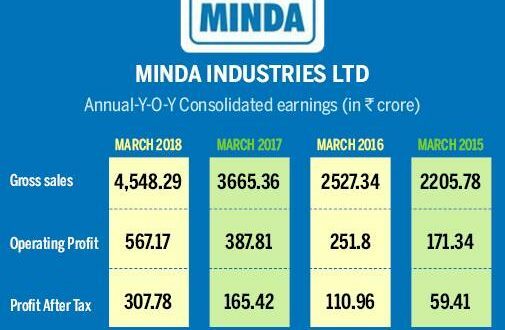 On the consolidated basis, the company has reported a rise of 22.02% in its net profit at Rs 46.21 crore for the quarter under review as compared to Rs 37.87 crore for the same quarter in the previous year. Total income of the company increased by 22.34% at Rs 781.73 crore for Q3FY19 as compared Rs 638.96 crore for the corresponding quarter previous year.